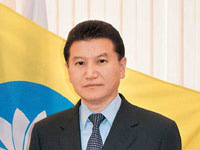 FIDE President, former President of Republic of Kalmykia Kirsan Ilyumzhinov with congratulations. Benefis of Dmitry Sharaev in Elista, capital of Kalmykia. folk group ‘Khurdn Sarva’, Khudlakhar-show, Lidzhi Goryaev, Felix Shorvaev, Victor Okchaev, Badma Sharaev and other kalmyk celebrities. Today is the Day of Memory and Grief. December 28 in each Kalmyk family with pain and bitterness recollect loved ones, forever remaining in a cold Siberian land, and with boundless gratitude pay homage to the older generation. [ De | Es ] African students celebrate New Year in Kalmykia. On the eve of the New Year holiday, they enrich your vocabulary. Father Frost, Snow Maiden, Christmas tree – these words are familiar to students, report KalmykiaNews agency. Seven held in the palace circles. There was, they say, a circle. Macroeconomic environment in 2012 deteriorated again – to slow down the dynamics of investment and economic growth in general, increased interest rates on loans to business, not increased certainty in the international markets. Against this background, found in the south of Russia figure memorable bright business initiatives, it was not easy. Fly from Istanbul to Krasnodar with Pegasus and go to Elista, buddhist capital of Europe. In 2011, we managed to make the main thing the first time we in the modern history of Kalmykia published, the strategic concept of socio-economic development of the Republic of Kalmykia. This is the plan. Plan for the future. Recital and presentation of new songs by Arslang Sandzhiev in Elista, capital of Kalmykia. Mergen Kim, Tseden Kanaev, Adyan Ubushaev, folk group ‘Zulturgan’, folk group ‘Yoryal’, folk dance group ‘Tulpan’ and other kalmyk stars. On December 17, the Department of Animal Husbandry and Breeding Russian Ministry of Agriculture held a meeting of expert committees on the issue of access to the use of advances in animal breeding under the chairmanship of Director of Vladimir Labinov, reported KalmykiaNews agency. Prime Minister of the Republic of Kalmykia Igor Zotov congratulated members of the Department of State Courier Service of Russia in Elista on their professional holiday. Head of Kalmykia Alexey Orlov: – The ninth message in the career of Russian President Vladimir Putin has probably been the most significant. A landmark for one simple reason: the common thread was a thought – taking care of the person meeting the needs and demands of its citizens. All noted direction of message to solving specific tasks. In 2013, in Elista we will open two new kindergartens. Today, 14 of December, new Prime Minister of the Republic of Kalmykia Igor Zotov visited Kalmyk State University (Elista), reports KalmykiaNews agency. [ En | Ru ] Oil company “Shell International Group” has presented reanimobile for Children’s Hospital of Kalmykia, reports KalmykiaNews. A reanimobile (class “C”) will allow timely render qualified medical help. “In case of continuation of the project the social program will be continued”, – said General Director of “Shell Oil and Gas Development (III)” Evgeny Boyarshin.